Hello, I am new here. I've been researching my grandfather's ancestors for quite some time. I recently went back through some copies of photos and documents that I received from two cousins. I found this information about my great-grandparents marriage. I would appreciate help in translating it. I recently found my great grandfather Vincenzo Marchetto's Ellis Island record. He arrived in 1900 with his mother Filomena Gelticore. His father Michele Marchetti was waiting for them and his address of 125 Mulberry St. New York was on the manifest. The family was from Foiano. I've never found my great grandmother Rosario Silvestre's Ellis Island record. I did find her sister Rosa's. We have their mother's name as Maria Madelina Casamassa. On this paper it looks like Nadalina to me. I don't have any records from Italy. This is my first attempt at posting here, so I hope I have it figured out. Hi Dawn! Welcome! Okk this is a fairly easy document to translate. 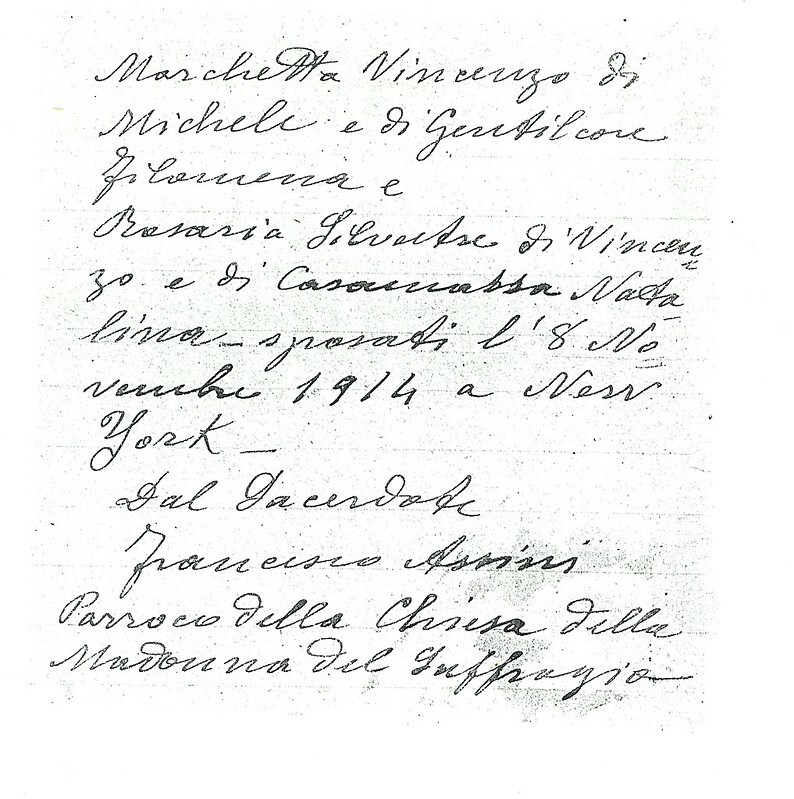 MARCHETTA Vincenzo, son of Michele and GENTILCORE, Filomena and Rosaria SILVESTRE daughter of Vincenzo and of Casamassa, Natalina married 8 Nov 1914 in New York - and then it gives the Church name. Does this help? That does help. Thanks! That was about what I was expecting it to say. Could you also translate the church name? I would like to see if I can find the record there if the church is still existing. I was also wondering about the Dal Sacerdote. In Spanish sacerdote means priest. Is that by the priest? Wouldn't a priest always have done the marrying? Hi Nuccia and Dawn. The last part after New York says: by the priest Francesco Assisi, parish priest of the church "Madonna del Suffragio". If you google "Madonna del Suffragio" and New York you will come up with some Ancestry records. The 8th post down has a picture of the church and the address. Thank you, Mary. I was thinking that Francesco Assissi would be the church name. This makes sense. I did as you suggested and came up with this photo. Any ideas how I might get the actual record from the church? 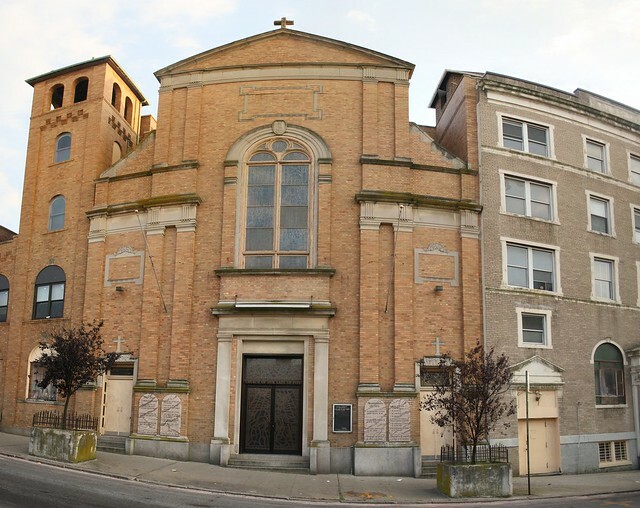 I did some searching and found that the church was closed in 2007, but if you go to this site it will tell you where the records are housed. Thank you, Mary. I will try calling the church where the records are housed on Monday. Would like to know if you're successful in getting the records from the church. I also found a record on ancestry.com where Vincenzo bought the marriage liscense. Now if I could just find Rosaria's immigration information.